Portadown return to The Oval tomorrow (Saturday) for the first time since last season’s controversial Irish Cup final defeat by Glentoran. 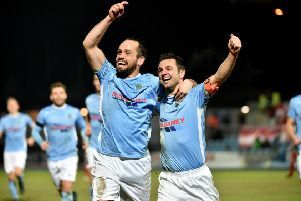 The Danske Bank Premiership match will mark 133 days since the Ports lost the cup - with talking points from the showpiece casting a cloud over the summer. However, rather than revisit the debate over what might have been, Portadown manager Ronnie McFall is putting his focus on the club’s future prospects. “The cup final is now in the past and we must move on, with this season a clean slate,” said McFall. “Whatever happened last time in the cup final no longer has any bearing on the squad. “Our only objective this weekend will be to get three points and help our league season. Portadown captain Keith O’Hara and experienced goalkeeper David Miskelly both remain ruled out of team training due to injury. Playmaker Peter McMahon is on the sidelines with groin trouble and Shea Conaty has escaped long-term ligament damage but must still rebuild the strength in his knee before playing any role on the pitch. To add to the club’s defensive issues, Garry Breen sustained knee damage in the League Cup win over Larne and Ken Oman is struggling with hamstring trouble. “It is frustrating as we have not yet had the opportunity to get our full-strength side out on the pitch,” said the Ports boss. “We put so much hard work into the summer fitness programme and bringing in Scott Paulin has certainly helped enhance that core strength across the group. “However, injuries are part and parcel of football and, in the case of David and Keith, sometimes the most innocuous looking incident can rule a player out for a long-term basis. Saturday’s visit to Belfast will mark the only away date in September’s league programme. Kick-off at The Oval will be 3 o’clock.